You can download a photo for a dollar! Its to help me get new lenses. The Arenal Volcano, in Spanish Volcán Arenal, is an active andesitic stratovolcano in north-western Costa Rica (10.5N, 84.7W), around 90 km north-west of San José, in the province of Alajuela. Recognised as a volcano since the 19th century, it was known by foreign investigators as "Volcan Costa Rica, Rio Frio", "Canastos" Volcano and "Cerro de los Guatusos". 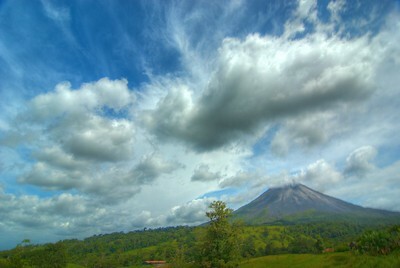 Arenal is the youngest and most active of all the mountains in Costa Rica. Scientists have been able to date it back to more than 4000 years ago. The area remained largely unexplored until 1937, when a documented expedition took place to reach the summit. 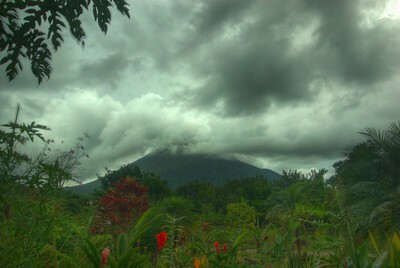 Once locally known as Cerro Arenal (i.e. Mount Arenal) it was presumed extinct until July 29, 1968 when an earthquake caused it to erupt, after approximately 400 years of dormancy. The eruption wiped out the town of Arenal and killed 87 people . It lasted for several days, and during that time destroyed crops, property, livestock, and forests. 15 square kilometers were buried and the explosion affected over 232 square kilometers. The eruption caused three new and active craters to form. Before the eruption, there was a wide veriety of plant and wildlife on the mountain. It has been active since the explosion and can be reported to have minor eruptions every 5-10 minutes. 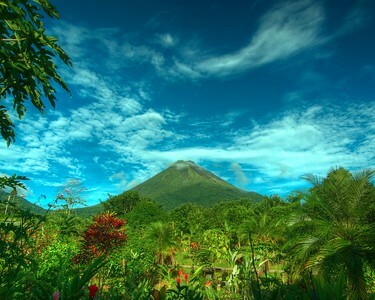 Arenal rises 1657 metres above sea level and overlooks Lake Arenal; both are part of Arenal Volcano National Park. 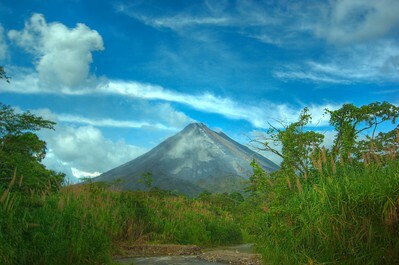 The country's most active volcano, Arenal's eruptions are strombolian in type, being frequent but moderate and can be viewed without danger as long as the viewers are behind the safety perimeter. This constant activity and minimal endangerment makes Arenal a popular tourist destination, especially at night (See image), because the lava and incandescent rocks make a spectacular sight. 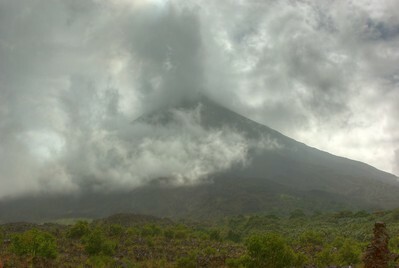 The last major eruption of Arenal occurred on August 23, 2000. 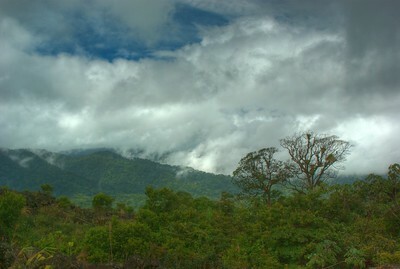 Most of the time, the volcano is surrounded by clouds near the tip, and it is touted as good luck to see the whole volcano without clouds. The volcano heats several hot springs nearby, including Tabacon, a popular tourist destination. 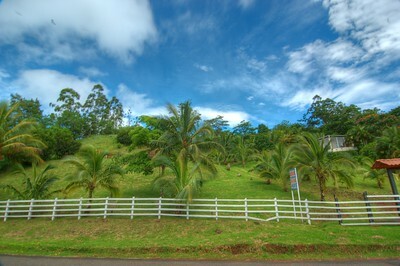 A view from many of the dirt roads. We drove over 500 miles during out week @ Costa Rica. This was the view from our Hotel. Yes this is the depth of color, the only thing I did was take 4 exposures to show the vegetation at the bottom of the photo. 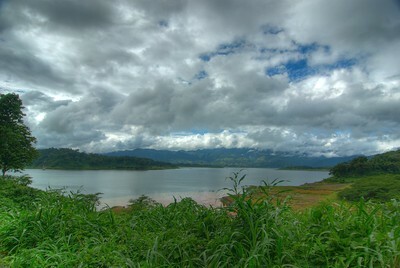 A view of the Arenal lake which is located just south east of the volcano. 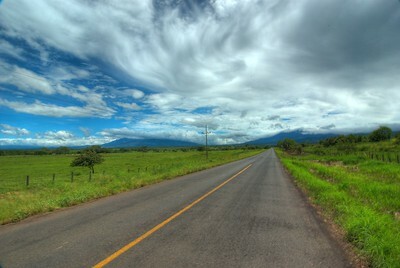 You can't see the volcano because of the rich cloud cover Costa Rica offers. It could have taken several hours to get to our next destination, as the narrow roads offered great views. This is a view of two volcanoes (both covered by the nice looking clouds) the one to the left is Miravalles and to the right Terorio. This shows exactly the terrain our crappy Hyundai had to drive in. It eventually overheated and I had to buy some coolant before returning it. Again a very nice photo of the overwhelming torrential forest. Does anyone have a chair? 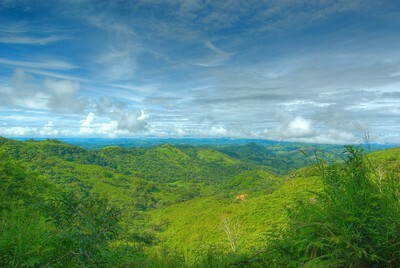 Did you know that 25% of the country is a protected natural park? Ah finally the beaches. This was just after sunset. You still get good luminescence from the sun, the waves were actually wayyy to the left. The sand below was wet from a previous long wave that pushed all the way up to the tide line. 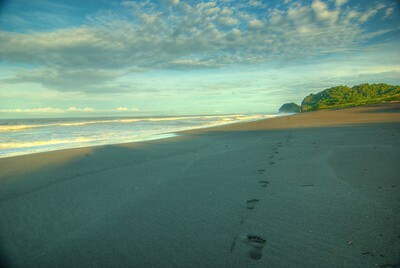 This is a black sand beach, we got up @ 5am to take this photo and someone had already walked on it. Not bad though. 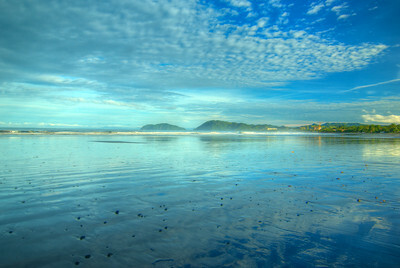 A photo in the morning of the Jaco beach, lots of surfers were out. 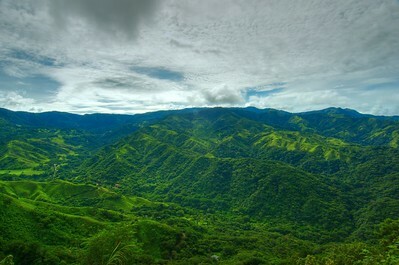 This is a photo of a PART of the largest waterfall in Costa Rica. 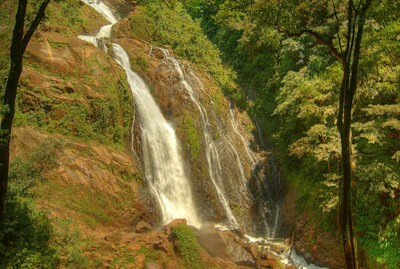 Its called "Agua Viva, Catarata d'". We basically had to pay 15 bucks to hike to this fall, it was a major pain. 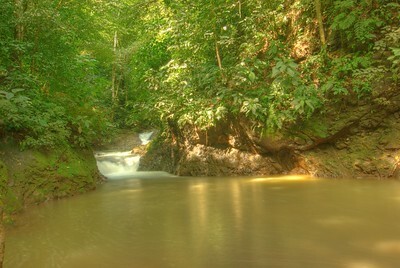 This is the bottom of the "Agua Viva, Catarata d'" waterfall. The water was full of minerals and was not clear. It was still pretty warm. 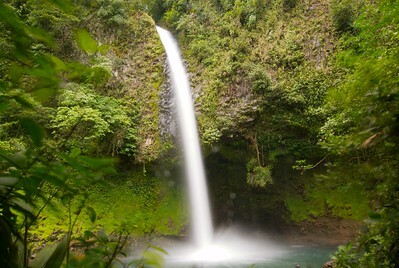 This is the La Fortuna waterfall. 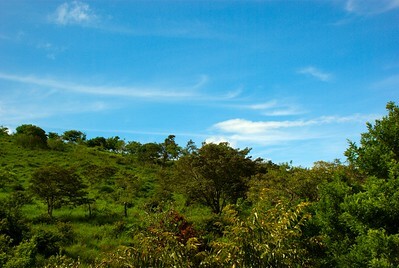 Its located near the city of... "La Fortuna". I think it was around 3 or 4 US to get in, and about 100ft down a set of winding steps. 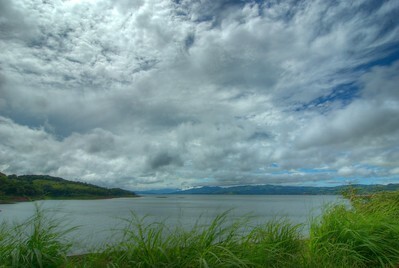 I actually took this with a wide angle lens using a .6 neutral density filter to slow the shutter down to 3 seconds. Everyone smiles in Costa Rica! This was taken at a petting zoo. 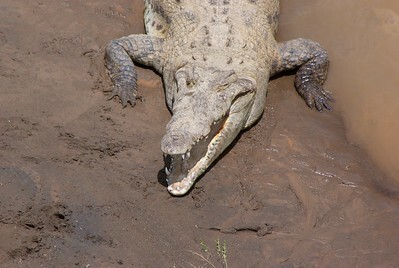 (just kidding, taken at 210mm zoom) Crocodiles, which have a longer snout than alligators, live in several rivers of the area. Their smaller relatives, the caimans, are also present near the Atlantic and Pacific coasts and in some rivers in the interior part of the country. Famous places for spotting these creatures include Tortuguero and Corcovado parks. In past years these animals reached dangerously low numbers, which encouraged breeding and protection programs. 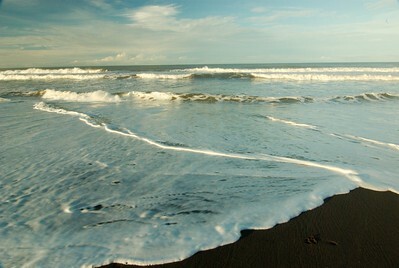 Another photo of the black sand. 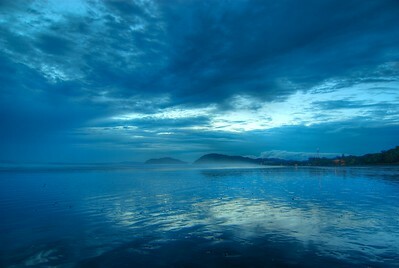 This beach was actually located near Jaco. 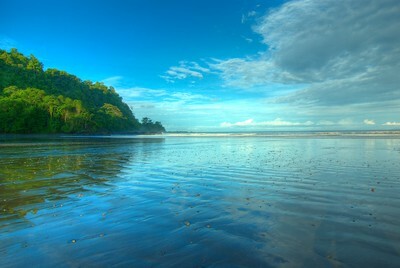 Jacó is a coastal town in Costa Rica's Puntarenas province, located on the Pacific Ocean. 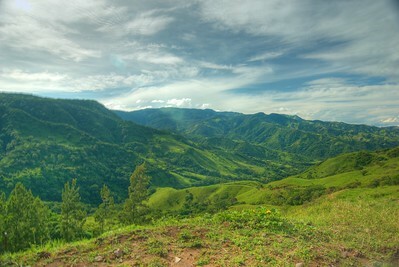 Jacó is approximately a 1.5 hour drive from San José, its popularity has also attracted quite a bit of drugs, crime, and prostitution which is legal in Costa Rica. We kept our guard up, my wife Laura is trained in the Southern Praying Mantis (martial art).